When it comes to watching satellite TV on the go, far from home or anywhere else especially in an RV, many people prefer to select the Winegard satellite dish because of its automatic satellite capturing feature and second being its portability which makes it an excellent portable satellite dish. The main center of attraction on the Winegard satellite dish, also known as Winegard Carryout, is its automatic settings feature which means you just have to connect the coax cable and power cord and the Winegard carryout will automatically find and point towards your desired satellite. The Winegard satellite currently supports DIRECTV and DISH Network. It is powered by vehicle cigarette lighter. It has both temporary and permanent mounting options. Many people also use it to watch satellite TV in their homes. The Winegard satellite dish comes with a protection dome that can easily be un-screwed and removed for setting your desired satellite. It comes with pre-set settings for DIRECTV so you just have to connect it with your DIRECTV receiver. For setting this Winegard carryout for DISH Network you just have to operate two more DIP switches that are located on the electronic box at the back of reflector. After you have made the changes and plugged it back to the power source, the Winegard Carryout portable satellite dish will just take a few minutes to automatically locate and point towards your respective DISH Network satellite. 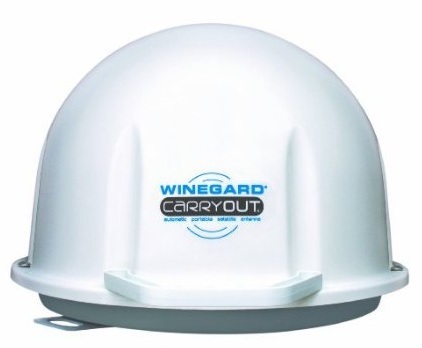 The Winegard satellite dish comes with and optional carrying handle that you can install easily and carry your Winegard carryout anywhere you like. It only weighs 12 lbs and measures 16×22.5×25 inches. 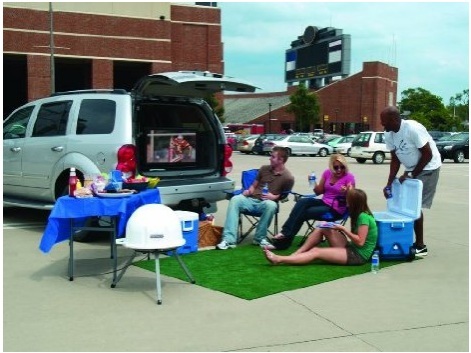 The Winegard Carryout comes with all the necessary accessories including a 50 feet long power and coax cable. It views single satellite at a time and if you want to make a switch then the transfer only takes 3-5 minutes. The Winegard dish has the ability to automatically switch between provider’s Ku-band satellites. The Winegard Carryout satellite dish is available at Amazon (with FREE shipping) at a special 15% discount price that might jump back to normal at anytime.